How compatible are Aquarius women and Aquarius men mentally, emotionally and sexually? Talk about a match made in heaven! The Aquarius woman and Aquarius man meet with their heads in the clouds and they never leave. The female and male water bearers get along so famously they rarely run into problems for they share excellent love compatibility. And when they do, they know how to solve them. It’s not difficult for this air sign to meet others who share their zodiac sign, for the Aquarius is a social butterfly. Both the Aquarius woman and man are both extroverts who love a good party and enjoy the company of anyone who is willing to debate with them. And they’ve certainly met their match with another Aquarius! Known for thinking outside the box, Aquarius men and Aquarius women always have a unique perspective on things and their quest for knowledge is rivaled only by their partner. When they start talking their discussions are likely to last all night long. The Aquarius woman is fun and flirtatious and he is playful and charming, so their witty banter is unstoppable. They love a good challenge and try to one-up each other all the time. For those who don’t know the Aquarius sun sign, they might think they were arguing. But friends and family know better, that they’re simply having a healthy debate. Because they are so like-minded, they easily take their relationship into the bedroom. And this is where this Aquarius-Aquarius couple really soars. There’s never a dull moment between these two, for they both bring their own mind games and fantasies. The Aquarius man is up for anything she throws at him, and she loves his creative nature between the sheets. Neither one is particularly concerned with physical pleasure, and are simply enjoying themselves on a mental level. This means their sexual union is not as passionate as others, but they don’t mind at all. This means they don’t have to worry about their partner getting upset over something they don’t see as a problem. Either the Aquarius male creates a dream world or he Aquarius female does, and they take turns completing each other’s cerebral experience. And they don’t have to commit to each other right away. They are each in it for the fun and adventure – the more serious stuff can come later. This is true outside the bedroom as well, for both the Aquarius woman and Aquarius man are extremely independent. They are often out on their own, pursuing their own interests, and not worrying about what their partner thinks or feels. And when they’re traveling together, watch out! It’s a whirlwind adventure that others would have trouble keeping up with. The only thing that would grind this Aquarius woman Aquarius man couple to a halt is real world responsibilities. Neither individual in this pairing cares about boring life details and would rather have someone else take care of it. But when it’s just the two of them, someone has to take the lead and keep track of their household duties. Either one could handle the task, it’s just a matter of who is willing to step up and accept the position. For best results, the Aquarius Aquarius match should split up the errands so neither one is doing more or less than their mate. And even if something does go wrong, they will most likely remain friends. Because for these two, it is a rare connection they have found with each other. 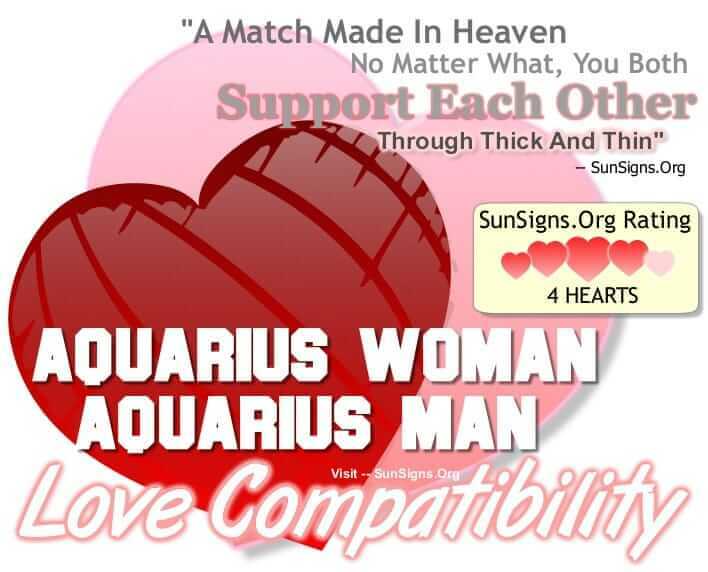 Aquarius is a fixed air sign, the Aquarius woman Aquarius man compatibility gets a FOUR Hearts rating. If they can balance fun with responsibility they will have a wonderful life together.